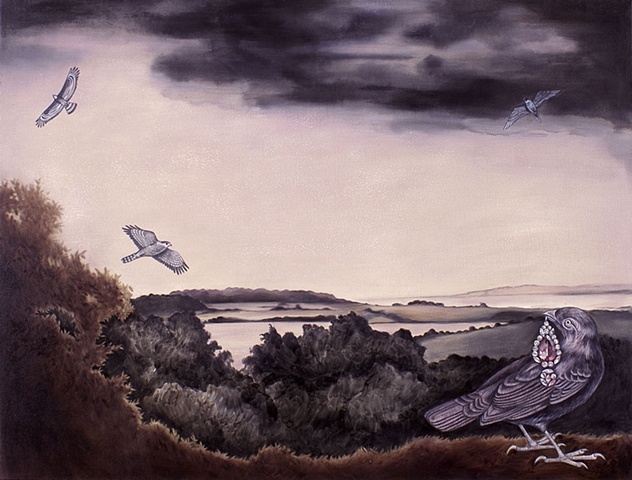 Museum 52 is delighted to present a show of new work by Kay Harwood. This will be her first show with the gallery. 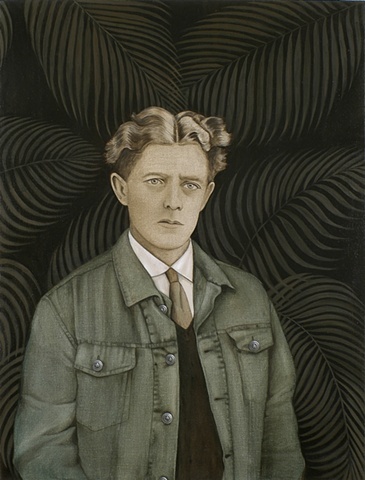 Harwood has produced a series of haunting landscape and portrait paintings imbued with traces of the uncanny. Her paintings originate from assemblages of disparate, collaged elements, pieced together in such a way that they depart almost completely from their sources mixed timeless sources. In Bridies Field, 2005 a swarm of gulls circle in the middle distance above a freshly furrowed field. 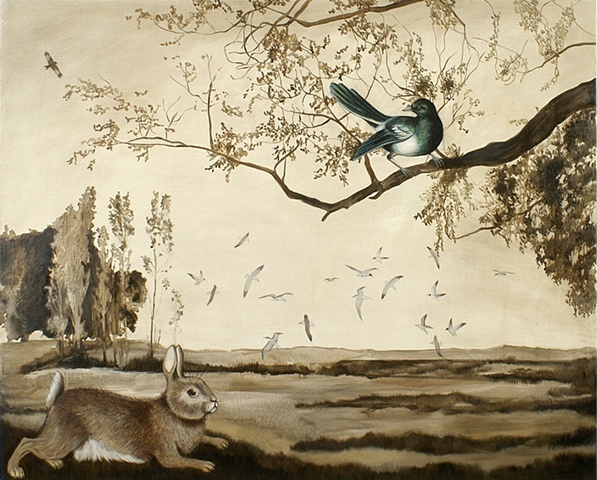 To their left in the foreground a rabbit bounds into view, seemingly rendered unable to move, as if fixed by the gaze of the viewer or the Chinoiserie-esque magpie that sits in a tree branch to the top right of the painting. The background and tree all have a similar colour (tonal variations on umber) as if the ploughed field has sullied its surroundings. This choice of background references the monotone, almost theatrical backdrops of some of Gainsborough's portraits; these were stages on which his subjects could perform, though, as Harwood does with both her portraits and landscapes, he always imparted a little of his own sensibility upon his sitters. In Boy in a Denim Jacket, 2005 a young man stares out of the image, past the viewer rather than looking them in the eye. The indirect gaze has a very different result to the direct gaze apparent in historical portraiture. Instead of instilling the figure with a sense of immortality or the painting with a mood of grand memorial Harwood creates a subdued moribund figure. The ambiguous flat, leafy background again references stage backdrops and the Victorian photographs that are used in her collages. 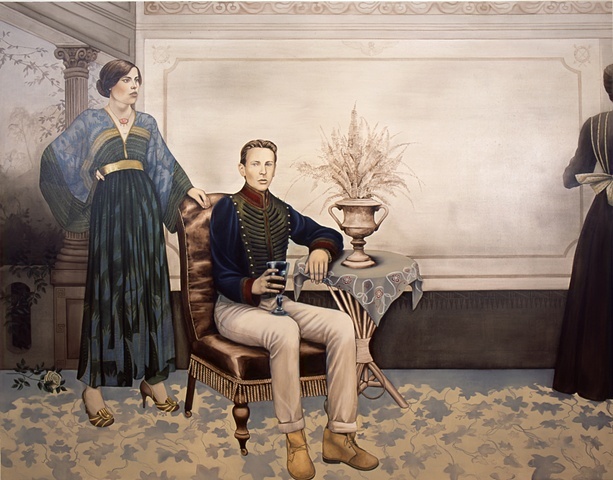 Harwood's images are rich with art historical and contemporary references. They are formed through the strange mélange of materials used in her initial collages, which result in incredible images that seem timeless and without location. 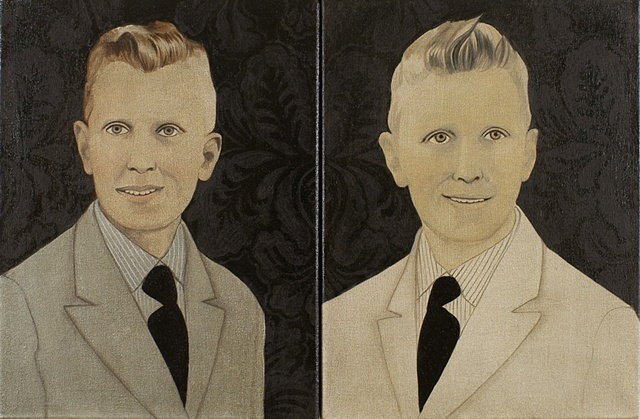 The paintings are narratives with no beginning or end, though they possess an ominous atmosphere that suggests what we are seeing is a moment captured before something more tragic; portraits and landscapes filled with portent.